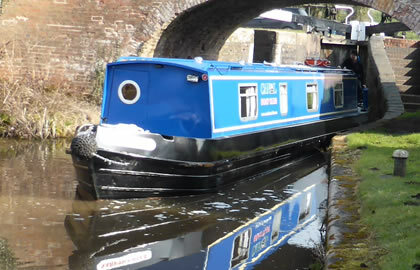 Rural cruise through the lovely Cheshire countryside to Timperley and catch a 15 minute tram ride into Manchester city centre where there is a wealth of culture, restaurants and cafe's. Also for some excitement try the new Crystal Maze experience to test your skills , also no visit to Manchester would be complete without a visit to one of the country's most famous Football clubs, Manchester City. If cars are your thing then visit the Museum of Transport where you will find the largest collections of its kind in the country. Cruise through tunnels and pretty villages, with only one lock each way the route is ideal for novices, and for those wanting a large city to explore. Northbound (Saltersford Tunnel to Preston Brook) - Entry on the hour until 20 minutes past the hour. Southbound (Saltersford Tunnel to Barnton) - Entry 30 minutes past the hour until 10 minutes to the hour. Northbound: open on the hour, and remains open until 10 past the hour. Southbound: open at half past the hour, and remain opens until 20 to the hour. Opening times are as follows: mid Mar, Apr, May - 8am-6pm. Jun, Jul, Aug - 8am-8pm. Sep - mid Nov - 8am-6pm, Mid Nov - mid Mar Weekdays 8am-4.30pm. Weekends 10am-2pm. Closed for lunch daily 12pm-12.45pm. Closed 24 Dec 09 - 04 Jan.
Leaving Anderton, you will be heading towards Barnton Tunnel, which emerges onto a hillside overlooking the River Weaver, with a fantastic view down to Saltersford Locks. Do make sure before you enter the tunnel, that there are no boats coming from the other side, as it is only wide enough for one boat at a time. At the east end of the tunnel, you will see some handy shops, so maybe a good time to stock up, if you have not already done so. Moving on, you will now enter Saltersford Tunnel, again, two boats cannot pass in this tunnel, so do take care when entering and leaving it. Passage is timed - northbound is on the hour to 20 past , southbound is half past the hour for 20 minutes. Once through the tunnel, you will again be in open countryside and not far from your mooring for the night which is by bridge 209. Not too far from the mooring about 1/4 mile to the north of Bridge 209, so take the road to your right by the bridge, you might like to have a meal in The Holly Bush Inn, Little Leigh, Northwich. Food is served at lunchtimes and evenings, along with traditional ales. There is a large beer garden with children's play area, so the whole family can relax before settling down for the night, ready for tomorrow's journey. You should now have travelled about 4 miles in 1.45 hours. Today you will head towards Timperley Bridge No. 33, where you will need to turn around for the return journey. When you leave your moorings, you will soon enter some woodlands, just prior to Preston Brook Tunnel which is 1239 yards long. From the North end of the tunnel, you will see a sign announcing that from here onwards, you are now on the Bridgewater Canal. You will notice that the canal now splits into two, where you will need to bear right. 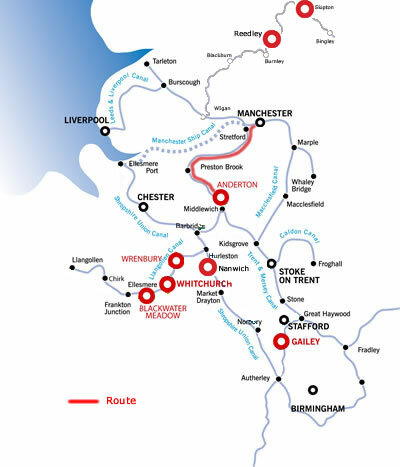 If you have the time, and want to visit Runcorn, then bear left for the 1½ hour cruise to the end of the canal, otherwise, keep left and make for Stockton Heath, a suburb of Warrington. Runcorn (if you chose this route), has a really impressive road bridge, called the 'Silver Jubilee Bridge'. It links Runcorn to Widnes and is around 1,082 feet long, and it really is worth taking the detour to Runcorn just to see it. Back towards Preston Brook Marina, bear left on a rural stretch until you reach Higher Walton, which is a pretty estate village, with local shops and amenities. A nice place to stop for lunch is the Walton Arms in Higher Walton. Children are welcome here, but only if they are dining with adults. If you have time, you might like to visit Walton Hall in Higher Walton. This beautiful house and its gardens makes a nice day out for all the family, with play area's for the children. And moving on, towards Stockton Heath, it becomes more urban and is a popular area for walkers and fishermen. Stockton Heath is North of London Road Bridge No. 15, and is a suburb of Warrington. This side of the canal is quite built-up, but on the South side, it is still very much unspoilt and open. Next, you will pass by Grappenhall and Thelwall, where there is a pub called The Penny Ferry Inn. You can get a drink and maybe a snack here whilst waiting for the Penny Ferry to transport you across the Manchester Ship Canal, for a minimal fee. Once back on your boat, you will cruise towards Lymm. Lymm is a pretty little town with the streets tumbling down to the canal side. If you want to stop here and have a look around, there are 24 hour moorings, which is handy for the fish and chip shop! In the town centre is Lymm Cross, built in C17th, and the centre-point of the town. You will now pass through some small villages – Oughtrington, Bollington and Dunham, to name but a few. The Swan With Two Nicks is a nice pub in Little Bollington, near the canal, and not far from Dunham Massey Country Park. As you leave here, you will notice it becoming more built-up as you approach Sale. You will need to moor at Timperley Bridge No. 33, where you will turn ready for the journey back to Anderton. From Timperley, you can get the Metrolink tram into Manchester, where there is a wealth of culture, restaurants and cafe's. On the canal side, you will find The Waterside Arts Centre and The Robert Bolt Theatre. In the Waterside Plaza, you might like to eat in The Waterside, a modern bar serving food all day, with a patio area overlooking the canal. They have a strict dress code, so do check first. Try the new Crystal Maze experience in Manchester. - You and your team must test your skills, solve mysteries and overcome challenges both mental and physical. They’re in four adventure zones – Medieval, Industrial, Aztec and Futuristic. Plus they’re all against the clock. The more challenges your team completes successfully, the more Crystals you win and the more time you’ll get to catch tokens in the iconic Crystal Dome. If cars are your thing then visit the Museum of Transport where you will find the largest collections of its kind in the country. No visit to Manchester would be complete without a visit to one of the country's most famous Football clubs, Manchester City. Begin at the museum and learn about the club's 130 year history. Have a go at commentating on some of the glorious goals or relive the greatest moments on the video jukebox. Take a look behind the scenes when your tour guide will give you an insight into the day to day activities of the club or walk in the footsteps of your football hero's. You might also like to take the tram as far as Stretford, if you have time. You have cruised 22 miles, and navigated 1 lock, in just under 7½ hours. Today you make your return journey to Anderton Marina. All the above stops and locations are suggestions only and you are free to moor elsewhere if it is safe to do so.